Blood typing is the first blood test that will determine if your blood is compatible with the potential donor's blood. If the donor's blood type works with your blood type, the donor will take the next blood test (tissue typing). Kidney donors must have a compatible blood type with the recipient. The Rh factor (+ or -) of blood does not matter in a transplant. What if me and my donor are not a match? If blood types are not compatible, the donor will not be able to donate directly to you. However, the donor may consider donating through a paired exchange program. Paired exchange programs allow you to get a kidney from another donor who is not a match for their intended recipient. Paired exchange involves two living donors and two recipients. If the recipient from one pair is compatible with the donor from the other pair, and vice versa– the transplant center may arrange for a "swap"–for two simultaneous transplants to take place. 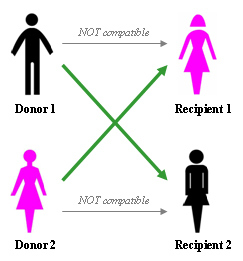 This allows two transplant candidates to receive organs and two donors to give organs though the original recipient/donor pairs were unable to do so with each other. Where can I find more information on paired exchange programs? Contact other organizations which might help. Following are links to other organizations which help to facilitate exchanges. PLEASE NOTE: these organizations and their websites are not under the control of the NKF, and NKF assumes no responsibility for their content or services. These links are provided for information purposes only, and should not be considered an endorsement or recommendation by the National Kidney Foundation.